Here's a great new UK online slots game from Eyecon gaming. This Irish themed 5 reels, 25 pay lines online slot game has a straight-forward approach with lucrative bonus rounds. In addition to the Wilds, there are 2 separate Bonus Rounds and a Progressive Jackpot to be won at any time. There are heaps to be won in this charming Irish free slot game. The reels are certainly spinning with Luck carrying Wilds and 2 different Scatter Symbols. The slot bonus spins game features the entire Irish package: leprechauns, fairies, four-leaf clovers, and Celtic letters. 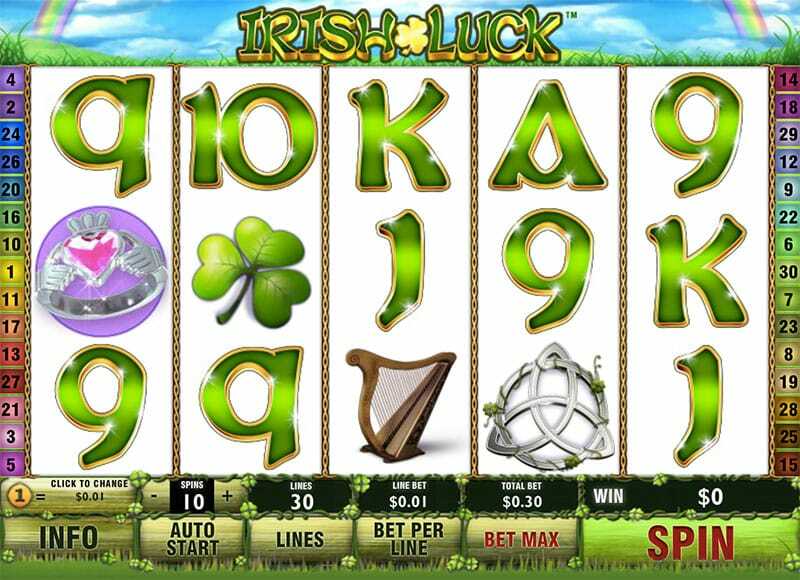 Developer Eyecon tends to keep their slot games simple enough to make them accessible while loading up on the goodies – as evident in Irish Luck Jackpot. Eyecon was recently acquired by UK gaming giant Playtech. This happened in February 2017 in exchange for a sum of £50 million. Playtech’s hope is that their industry-leading content paired with Eyecons quality games with boost their position in the United Kingdom. However, Eyecon originally was an Australian software developer based in Brisbane. They’ve been around since 1997 developing games for traditional and online casinos. Their archive of online gaming is not as large as other software developers but instead they have a rather diverse portfolio. It spans from land-based and online gaming systems to television multimedia integration, and even casino management systems. 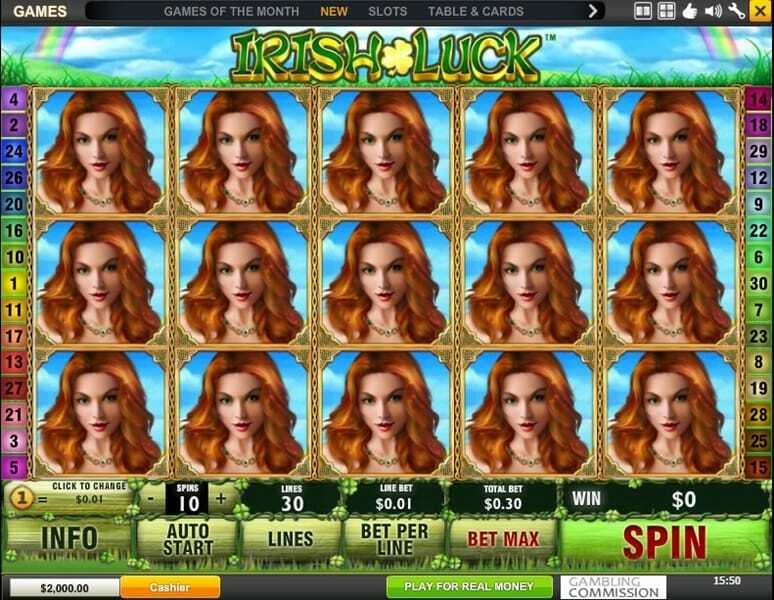 The question needs to be asked, is there a need for another Irish-themed online slots game centred around luck? The answer: Yes. Irish Luck Jackpot keeps things quintessentially Irish with its design and uses that very Irish-ness to bring the game to the next level with Bonus Features and Bonus Rounds. Fairies and Leprechauns keep to their unpredictable nature, and add suspense to the game. While a basic yet great concept of spotting letters that make up the word ‘Irish’ brings you closer to the Jackpot. Then of course is the lucky Four-Leaf Clover – any Irish slots game will be incomplete without it. It is all very well thought and tastefully put together, it does not go overboard nor is it too subtle. The reels in this slots game are modelled after a wooden Irish pub sign, and the symbols follow suit, featuring iconic Irish imagery: Fairy, Pebbled Path, Stout, Pot of Gold, Mushroom, Tree Trunk full of Gold, Leprechaun, an Irish Castle, Gold Coin, Rainbow, and the Letters I,R,I,S, and H.
Aside from the look of the game, Irish Luck Jackpot gives players plenty of freedom to customise the game to their liking. Players can select the amount they would like to bet and the number of pay lines they’d like by clicking on the ‘Change Bet’ and ‘Change Lines’ tab, respectively. And if you are feeling particularly laidback, there is an Auto Play option that will do the spinning for you. So sit back, relax, and let the mingling commence with the Irish Fairy Folk. The Four-Leaf Clover represents the Wild Symbol in this game. Like all other Wilds, the Four-Leaf Clover can transform and take the place of any symbol except for the Scatter and Bonus Symbols. An extra feature is that your winnings are doubled when the Wild symbol is used. The leprechaun icon represents the Bonus Symbol. If you land 3 or more leprechauns on the reels, you trigger the Bonus Round. The number of turns you get in the Bonus Rounds directly correspond to the number of leprechaun symbols you land. So, 3 leprechauns will see you through 3 turns, and with every additional leprechaun symbol you land, you get an extra turn in the Bonus Rounds. If during the Prize Pick Bonus you spot leprechauns behind the tree stumps, you are gifted Free Spins. That will bring you to the Free Spins Round where you not only get additional spins but your winnings are also doubled! If you land 3 or more Fairy Symbols, you activate a rather unconventional Bonus Round. Players have to choose from a series of four-leaf clovers to reveal matching symbols. If successful, the prizes up for grabs can reach up to 100 credit. Spelling out the word Irish with the symbols on the reels will land you a chance to hit the Jackpot. Irish, Luck, and Slots. It is a theme we often see in online casino gaming but never really tire of. That’s because it is a combination that has proven to work. The attributes go hand in hand and complement each other splendidly. That is exactly the case with Irish Luck Jackpot. The slot game brings these attributes together perfectly while offering irresistible bonuses and features to players. The bonus rounds include a little bit of play and mischief from whimsical Irish characters like the leprechaun and fairy that adds a light-hearted feel to the game. To top that the Progressive Jackpots are always a tempting proposition. All in all, it’s a charming slots game with something to offer.